An 8 years old young girl, came to the clinic accompanied by her father complaining of snoring during sleeping and nasal obstruction. "Of course she has snoring. Look at her. She is obese." "How much does her weight?" "You have to control her diet." "Wallah doctor, she drinks pepsiyat everyday, she took wajbah during breakfast. I gave her money before going to school then during recess, she bought lots of chips. When she came home, she feel happy to eat again with us during dinner." Some parents think that when their children are fat, they are actually happy, and healthy. In fact, they are not. In other way around, they didn't care much about the fact hidden behind their obese children.. 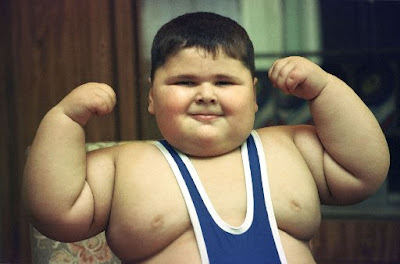 The following are some facts about.. "How do kids become obese or overweight?" Physical activity and inactivity are very important factors. Many studies have shown that kids who spend more time watching television and playing video games are at higher risk of becoming overweight. One in three high school youth do not engage in vigorous physical activity. Less than 30% attend daily gym class. Sprawling development that discourages physical activity and makes walking and biking difficult or dangerous is also a factor. **Spend time riding a bicycle, or jogging with your children, every weekend at least! **It's you first. Control your body weight! Some studies indicate that environmental chemicals may play a role. Researchers hypothesize that in utero or newborn exposures to chemicals such as endocrine disruptors (for example xenoestrogen bisphenol A—which is in food and drink containers) may damage the body’s weight-control mechanisms and lead to obesity. **'Once in a blue moon' snacks could be allowed. Avoid fast-food. **Mommy-doctors - Do they have enough time to cook and provide well-nutritious meal for the children? Anyway, instead of taking care other's health, make sure your family members always be in a constitutionally healthy condition. I can relate to this article. It is so hard to lose weight, and so many people struggle with their weight problems all the time. It reminds me of my book that has recently been published. The main character of my book is overweight, and also has many issues and struggles with her weight. But in the end she overcomes them, and finally manages to lose the weight that she subconsciously put on to protect herself from being hurt by love, which I think, is something a lot of people out there tend to do without even realizing it. Being overweight is not just about the physical, it's also about what is going on with a person’s psychological issues. The main character also comes to realize the importance of healthy eating and fitness. I am a regular user of Facebook if anyone would like to talk to me about my book. Carla Cunningham, Published Author of Alone in the Storm.